Here you can find information for the big brother of the Wemos D1 mini which can be found here in the Wiki. When you take a look at the figure 1 you will see it with one blink of the eye thet the old Wemos is different against the new verion R2. The old version has an ESP8266 12B or 12E model. The new one has a ESP8266 12F model on the pcb board. You see this in the defference of the Wifi antenna. Here is a Wiki link to the different ESP8266 modules. The next part for R2 are the 2x4 solder pins for the serial and I2C interface which is not on the old model R1. The techncal data/specifiactions are the same. SO as you see they look like an Arduino UNO inculding the stacks to mount different shields. Later i will give more information over shields which i have tested and there are a lot of them. First we will check that the right json index file is chosen. For that open File -> Preferences. Search for "Additional Boards Manager URLs:" (Figure 2). There you have an input filed. If that field is empty add this to it via copy&paste: http://arduino.esp8266.com/stable/package_esp8266com_index.json. Then close that window by hitting the OK button. If you have more then one link in that input field you have to use a comma after every link. So as done in Figure 2. Second we will look at the Boards Manager of Arduino IDE. As you can see in Figure 3 that the following things has to be installed. Possibile you have done this already together with the first installtion. Open Tools -> Board Selection -> Boards Manager, then search for esp8266 by ESP8266 Community. If you have fund it you will the same as in Figure 3. On the right side of that text you have searched for you can see the installed verion. Here in the sample it is 2.4.2. It is not installed you can make a choice under Select Version. If you start a new installation you can use the version 2.4.2. It works very well with both releases of Wemos D1. 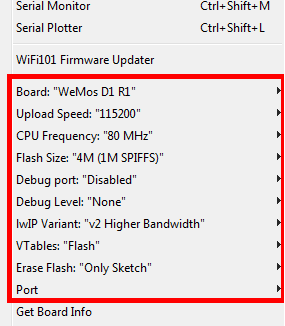 Open Tools -> Board and select the WeMos D1 R1 board. For the settings of release R1 see Figure 4. Don't forget to select the right COM port so far your USB/Serial adapter is connected. Otherwise you can change this later after you have verified your code and you are ready to compile and flash. Then you have to connect your adapter and after the typical PING under Windows you can set your COM port. 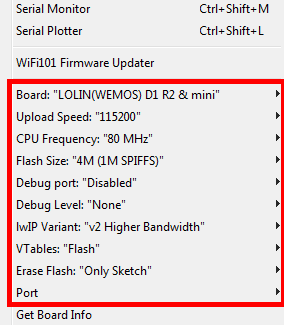 Open Tools -> Board and select the LOLIN(WEMOS) D1 R2 & mini board. And for the settings of release R2 see Figure 5, please. Don't forget to set your COM port. As you can see the settings are the same only the name of the board is different. Internal there some different settings but we dont need to know that. Arduino IDE does the work for you.